Our Hoover steam cleaners reviews can help you decide on whether the top steam cleaning brand – Hoover is right for you. The Hoover steamer cleaner is very popular. They are considered as “top-of-mind” products in the steam cleaning industry, which means a lot of consumers automatically associate the brand with steam cleaning in general. On this page we we’ll look at the reasons why. First let’s take a look at Hoover, the company behind the famous steam cleaners. Hoover joined the TTI Floor Care company in North America in 2007, but the company itself has been in the business since 1907. It all started when a man named W.H. Hoover purchased a patent and partnered with a former janitor who suffered from asthma, the man who invented the first suction sweeper that began the entire Hoover story. Since then, Hoover has provided high quality home cleaning solutions such as steam vacuums, carpet cleaners, boiler, and other specialty vacuum products. Hoover’s products are considered as top buys, but they are, thankfully, quite reasonably priced, so almost anyone can have the best Hoover steam cleaners at home. Hoover steam cleaners range between under $100 and up to $400. The stick vacuums are more affordable and belong to the lower price segment, while the upright vacuums are at mid-range. The more advanced canister vacuums are the most expensive. All products, however, provide excellent performance and durability. Hoover was able to build its brand strength and its credibility because it did not just copy technologies off other brands. Instead, Hoover came up with its own technologies, some of which went on to become standard technologies used even by their competitors. For one thing, there’s the beater bar, a Hoover invention which is now found in several competitor products. The beater bar is a metal bar that beats the carpet to release any dirt sticking to it. At the same time, as the carpet is being beaten, a suction is used to vacuum the dirt. The beater bar is able to loosen up dirt that has gotten stuck in the carpet fibers, resulting to more thorough cleaning. Hoover’s steam vacuum cleaning products are also empowered by the SpinScrub brushes, multiple spinning scrub brushes in sets of five or so that work together. These are great for deep cleaning because no spot is left unscrubbed. Another technology is the Clean Surge, which releases 50% more cleaning solution when you trigger the said feature. Based on a Consumer Research study, the Hoover SteamVac steam cleaning vacuum with Clean Surge feature model F5914-900 is the “Best Carpet Cleaner” and best product in the upright steam or vacuum cleaner department. The Hoover SteamVac with Clean Surge is a great buy. This deep cleaning vacuum uses the Clean Surge feature and five SpinScrub brushes to deep clean your carpets. If there’s one thing that we can say about this product, it’s that it is very thorough. It can remove even the most stubborn stains, even from carpets that haven’t been deep cleaned for years. upholstery nozzle and hose for cleaning hard to reach areas. According to consumers, they experienced some difficulty in draining the holding tank completely. This is a very minor obstacle though, considering that the steam cleaner was able to remove deep and longtime stains from carpets. Most of the users were more than satisfied with the cleaning capabilities of the Hoover SteamVac with Clean Surge, especially since the product ranges between only $130-$180, which means it is quite a deal. The table below shows the main Hoover steam cleaner SteamVac models and their respective ratings. Hoover has such a wide range of steam cleaners and vacuums that it can really be a headache to choose one. However, the main factors we first look at are price, rating and popularity among other consumers. To help you narrow down your search, see the table below. Okay, now I bet you have a much better idea on which hoover steam cleaners you’re interested in learning more about. Even though a model may be classed as “Not a Popular Choice” that doesn’t mean that its no good! 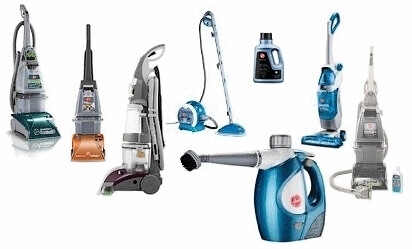 Hoover is an excellent brand that I do no hesitate to recommend. Do check out our reviews (listed below) on each of the above models to get a better idea on which is best for you.